I don't re-read books very much. In fact, Dan Ariely's book on behavioral economics was the first I've re-read in years. I first read it back in 2015 as a first year MBA student at Foster - he (or his work) must have come up in a class and it was interesting enough for me to seek out. I was walking to and from school at the time and found myself with a lot of listening time available and I started using Audible more and more. At the very least, the narrator alone is worth spending a credit on this book! It's interesting to go back and read something like this as I hadn't realized just how much I took away from this book (and, likely, so many others) I was using in my work on a regular basis. 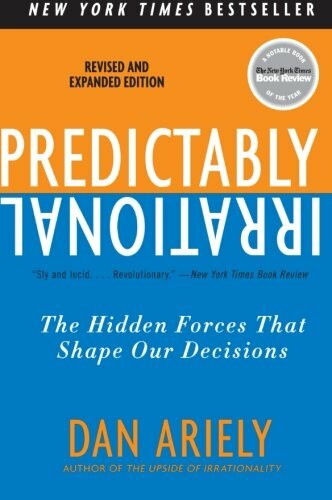 Each chapter is focused on a certain experiment performed - Dan outlines the "rational" situation and digs into the research performed to explore each behavior - for example, the impact of zero cost and how the decisions people make change based on the cost of those items - obvious, right? But the example he outlines offers a choice between a Hershey's Kiss and a chocolate truffle - the percentage of people who choose the truffle over the Hershey Kiss when there is a cost (even a minimal cost) associated versus the percentage of people who choose the Kiss over the truffle when the Kiss option is free is incredibly interesting. He takes similar behaviors and uses experiments to analyze them. I came away from this book with a new understanding of why people behave the way they do and how we might be able to influence that behavior. There's a lot to take away from this book and I really enjoyed it. However, as entertaining as the narration was - because I listened to this during my commute and not with a pen and the book in front of me, I didn't get to take notes or make as many observations throughout. If you're at all interested in why people do what they do - I'd recommend this book. Not all of the books I read for this blog are going to be business related, or self-improvement. In fact, I'm trying to mix in even some of the classics that I never got a chance to read (or maybe just forgot about). I've always wanted to go to Japan - the culture, the food, the video games, the scenery - everything seems wonderful there - I can't imagine a better place to go on vacation - yet I still haven't been! As soon as we booked the flights, we looked for some travel guides. If we're only going to do 7 days for our first time in Japan (extremely limited vacation time) we want to pack in as much as we can. This was the only book that the Seattle Amazon store had that wasn't just a book full of maps and it looked like a fun, quick read. It was. 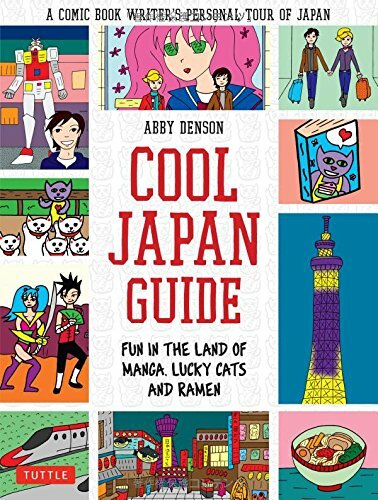 Abby Denson put together an entertaining, quick read (seriously, this book took me about two hours to read - that's like what it took me to get through 1/10th of my last book) and it covers just about everything you'd need to know for your first time in Japan delivered in a unique comic-book style presentation. Pop Culture (this section is titled "Manga and Anime and VIdeo Games - Oh My!" Admittedly, I've done quite a bit of research for this trip already (but have this immense fear that I'm going to miss something) - so I didn't think I'd take a ton of information away from this book - but Abby gets into the details of things I hadn't even thought about (vital things like the importance of getting ekibento before the Shinkansen and some of the cultural norms one should know before arriving) - the food section gets into even more detail about what to expect, what to order, and how to act in many different types of restaurants. One of the things I hope to accomplish with this blog is to get my thoughts out there on what I'm reading to hopefully encourage you to pick up a book or chat on here about the takeaways or what you're currently reading and what parts of your books are getting the most marked-up! I love hearing about or seeing how people mark what they read: some people take a highlighter to the entire thing, others scribble notes along the edges of the page, while others (who must have incredible memory - or out of respect for the author!) keep their notes in their head or on their computer. I tend to use my pen to highlight paragraphs at a time (I can't draw straight enough to underline) and usually take short notes when something resonates with me. 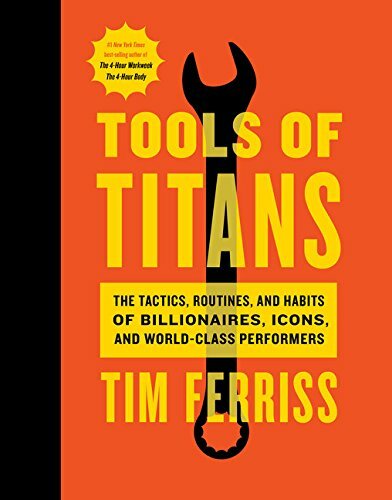 The first book I read that triggered my desire to get to work on this project was Tools of Titans by author, podcast host, and investor (I'm sure I'm missing a lot of other titles) - Tim Ferriss. I'm about two-thirds through this tome (400 of 673 pages) and will post a follow-up post covering the final 1/3. This book is long - it's taken me a while to get through but there are most definitely some meaningful nuggets throughout. However, if you've listened to his podcasts religiously (I haven't), you might not pull very much new material away. I haven't had too much experience with Tim Ferriss - I've listened to just a few of his podcasts and maybe one or two in which he was a guest but I can see why people find Tim appealing - he asks good questions, gets some interesting people, and can be pretty motivating. I think the most compelling reason I'd tell someone to not buy this book is it's difficulty to read and it's hold on you - it's a difficult one to get through if you're a completionist and want to read the entire thing. To his credit - he's well aware of that and approaches this less as a "read beginning to end" book and more as a collection of some of the "greatest hits" of his interviews. I'd take his advice and go through the people and the topics that interest you and read the others at your leisure. No phone 30 minutes before bed - this one is difficult - any of you go screen-less before bed? How do you do it?! I sleep with a TV on - I like the predictable noise of a TV much more than the loud stuff that may happen on the streets outside our apartment. Ketogenic diet - this is something I've thought about and will likely give it a try sometime soon - lots of his guests are on some variation of this diet. - I miss the sauna. The gym I used to go to back in Jersey had a sauna and it was a fantastic way to unwind. Recommendations to take a regular sauna came up a number of times in this book and made me miss those days. - Tim's interview with Chris Sacca and an (unrelated to the book but somewhat similar in takeaways) interview of someone I really admire (Michael Ovitz) both had a direct impact on how I approach my work. In Chris' interview, he mentions the importance of being curious, getting into meetings and finding ways to make yourself useful. "Go to all of the meetings you can, even if you're not invited to them, and figure out how to be helpful. If people wonder why you're there, just start taking notes." Ovitz, in an interview with Marc Andreessen (which is really worth the watch) notes the importance of curiosity but also of getting yourself into a position in which opportunities are more likely to present themselves - finding ways to provide value to people who can have an impact on the next steps of your career. I'll finish this Part 1 post with a quote that really stuck with me that came from Tim's interview with Jane McGonigal. "You should never publicly criticize anyone or anything unless it is a matter of morals or ethics. Anything negative you say could at the very least ruin someone's day, or worse, break someone's heart, or simply change someone from being a future ally of yours to someone who will never forget that you were unkind or unfairly critical. It's so common today to complain or criticize others' work on social media, or dogpile on someone for a perceived offense. I won't do it. It's not my job to be the world's critic, and I'd rather not rule out any future allies." Thanks for reading my first post! I'll wrap up this book sometime soon but will likely be posting 0002 soon with some great news! All pictures on this site were taken by either me or Jess! As great or as interesting as I think my opinions might be - they don't necessarily represent the opinions of my employer. Just getting that out there.